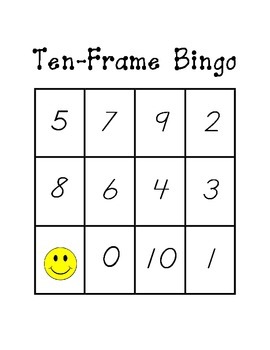 This is a set of Ten Frame Bingo cards for up to 21 students (plus a customizable blank) and calling cards featuring ten frames for numbers 0-10. 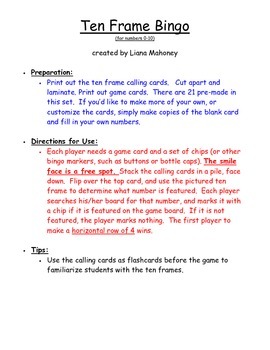 Just print everything out, cut out your calling cards, gather some bingo chips, and you're ready to go! 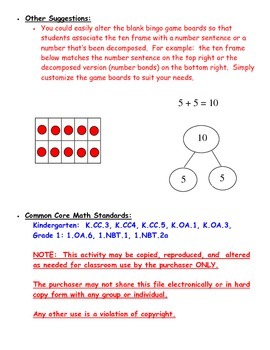 Great to meet Common Core expectations for K-1 Math, and perfect for subitizing practice. Also includes some suggestions for variations, and CCSS correlations.